Star in right field, ST in Exergue. Minted at officina S in Ticinum (Pavia, Italy) in 304-305 A.D. during his reign as Caesar under Maximianus. Sutherland, C.H.V., "Roman Imperial Coinage", Volume 6 (RIC), Ticinum, p286, nr 48a. hinterlassenen Sammlung und Aufzeichnung des Herrn Paul Gerin" (Voetter-Gerin), Tarraco, Constantius Chlorus, p321, nr 16. Sear, D.R., "Roman Coins and their Values" (RCV 4th Revised Edition), p312, nr. 3676, variety from Ticinum mint. 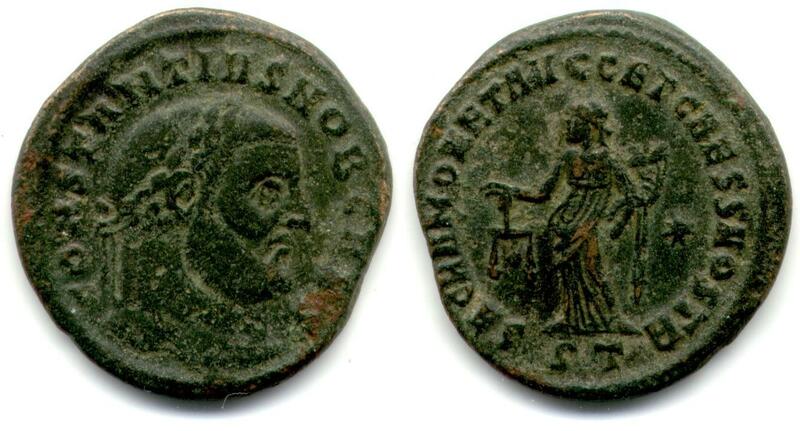 Van Meter, D., "Handbook of Roman Imperial Coins", p280, nr 29.